When Johnny Ribkins goes to his dead brother's house to dig up $100,000 he buried there years ago, so that he can pay back the man he's been embezzling from, he doesn't know that his past is going to make a claim on him. But when he finds out his brother had a child Johnny never knew about, and that his niece has, like many Ribkins, a strange talent, he feels obligated to take her with him on a journey of restitution that becomes far more complicated than he imagined. He should have known, though. Johnny's particular talent is making maps. If you need to get to something, he can draw you a map to it. Doesn't matter if he's never been there. He sees connections and he draws lines, and no one who uses one of Johnny's maps fails to get to their destination. Perhaps because he's drawn maps for other people for so many years, he doesn't recognize that his journey around Florida to the places where,over the years, he's buried valuables is a literal treasure map--one that gives him a future when his niece finally reveals what her true Ribkins talent is. At seventy-two, Johnny Ribkins shouldn’t have such problems: He’s got one week to come up with the money he stole from his mobster boss or it’s curtains. Fast forward a couple decades and Johnny’s on a race against the clock to dig up loot he's stashed all over Florida. His brother is gone, but he has an unexpected sidekick: his brother's daughter, Eloise, who has a special superpower of her own. Inspired by W. E. B. 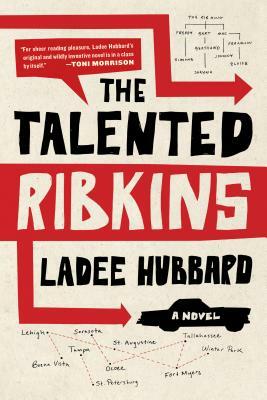 Du Bois’s famous essay “The Talented Tenth” and fuelled by Ladee Hubbard’s marvelously original imagination, The Talented Ribkins is a big-hearted debut novel about race, class, politics, and the unique gifts that, while they may cause some problems from time to time, bind a family together. Ladee Hubbard is the winner of the 2016 Rona Jaffe Foundation Writer’s Award and the William Faulkner-William Wisdom Creative Writing Competition for the Short Story. She lives in New Orleans, Louisiana. The Talented Ribkins is her first novel.